Heavyweight champ Brock Lesnar will be defending his strap against fast-rising Cain Velasquez this Saturday at UFC 121. While the deepest fight card of 2010 is still five days away, the Octagon’s media department has released the event’s extended video trailer to help tide you crazed fanatics over. Lensar became the planet’s top dog after his dramatic come-from-behind victory over Shane Carwin at UFC 116 in July. The submission win bumped his pro MMA record to a dominant 5-1. Despite having only six bouts under his bling-bling belt, half of Lesnar’s scraps have been of the championship variety. 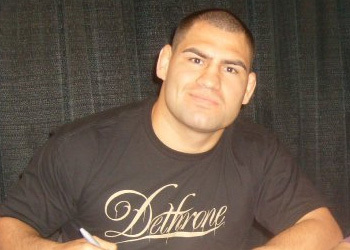 Velasquez earned his top contender status by putting down Antonio Rodrigo Nogueira at UFC 110 in February. The talented American Kickboxing Academy fighter is perfect through his first eight contests, ending all but one in devastating fashion. The pay-per-view event takes place inside the Honda Center in Anaheim, California.